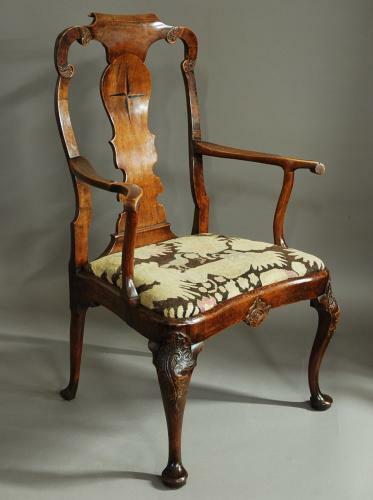 This chair consists of a scrolled top rail with carved ears to each corner leading down to the spoon back with inlaid star decoration of ebony and boxwood. The arms are elegant and of shaped design leading down to an upholstered drop-in seat, upholstered in original wool work in good condition. The inverted front rail has a central carved decoration leading down to the two cabriole front legs. These have carved foliate decoration to the knee terminating with pad feet, the back legs are of outswept design. This chair is in very good condition, of sound construction and can go straight into a home.